As patients become more scrupulous with who they choose for their desired beauty enhancement surgeries or procedures, Sugar Land Face and Body Plastic Surgery remains a pillar in the medical industry, offering a variety of beautification desires, surgical and non-surgical alike. From breast augmentation, rhinoplasty, chemical peels and liposuction to face lifts, mommy makeovers, tummy tucks and body contouring, patients need only to contact Dr. Eric Humble, who is devoted to providing his patients with confidence through exceptional results. 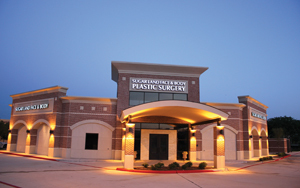 With more than 2,000 square feet dedicated to peri-op and post-op care, Sugar Land Face and Body Plastic Surgery has successfully performed nearly 1,000 surgeries in house since moving to its current location at 1692 South West Freeway. And the foundation for this success, Dr. Humble noted, is because he is keen on patient safety, made evident through his Sugar Land practice’s American Association for Accreditation of Ambulatory Surgery Facilities (AAAASF) certified on-site operating room. The AAAASF’s mission is to “develop and implement standards of excellence to ensure the highest quality of patient safety through an accreditation program. “Accredited facilities and clinics have been inspected and met 100 percent of the standards set by AAAASF for Accreditation,” and Dr. Humble, who’s exacting practice not only meets, but exceeds, those standards set forth by the medical community and its overseers, highlighting his practice as setting the “Gold Standard” for quality patient care. 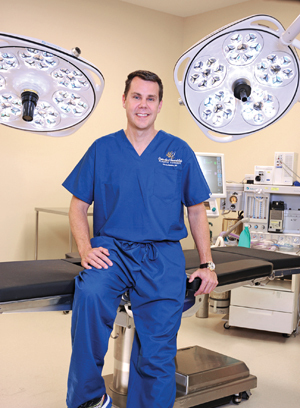 At Sugar Land Face and Body Plastic Surgery, Dr. Humble’s operating room – which features a separate entrance from the main building to offer both patient privacy and accessibility – features state-of-the-art equipment and is in compliance with all of the required standards, allowing Dr. Humble and his staff to provide concierge-oriented care to patients. Additionally, the surgical team is comprised of two RNs, a surgical technologist and an anesthesiologist, who is in-house the entire time a surgery is performed. Since opening his first successful practice in Sugar Land, Dr. Humble expanded his practice by opening a new office, Houston Dermatology and Plastic Surgery, located at 3030 South Mason Road in Katy in 2017. This location features plastic surgeon Dr. Mirtha Gonzalez, who completed her general surgery residency in the prestigious Michael E. DeBakey Department of Surgery at Baylor College of Medicine and plastic surgery residency at the University of Miami/Jackson Health System. Dr. Filiberto Cedeno Laurent, a Harvard trained and board-certified dermatologist with extensive expertise in skin cancer, complex medical, surgical and cosmetic dermatology, also practices at both the Katy and Sugar Land locations. Through its medical spa, Sugar Land Face and Body offers breast enhancement, body contouring and facial rejuvenation, but the medical spa has increased the facilities’ services to advanced non-surgical procedures, often referred to as aesthetic procedures. Some of the traditional procedures offered in the medical spa are Botox and fillers; however, the spa also offers procedures such as CoolSculpting, a fat-freezing treatment designed to reduce fat volume reduction; Micro-Needling treating moderate acne, fine lines and wrinkles, lax skin, burns, stretch marks, as well as skin texture and pore size; hair rejuvenation and Ultherapy, the aesthetic option to tighten, lift and tone skin. The only FDA-cleared procedure for non-surgical neck, brow and under-chin lifts, Ultherapy is ideal for those considering a facelift and uses ultra- sound energy to lift and tighten skin. “Ultherapy is a great non-surgical option to a facelift, as well as a preventative measure for the younger population,” said. Dr. Humble. 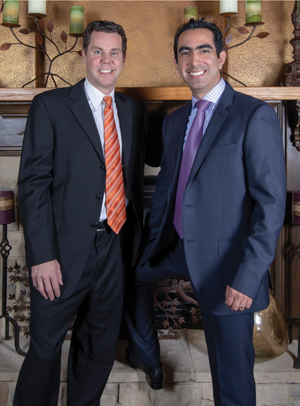 Dr. Eric Humble and Dr. Filiberto Cedeno Laurent. When patients come to him, their flaws are not shunned, nor are they pressured to fit into a mold determined by society. Rather, his practice is a sanctuary where someone can find a personal satisfaction and the peace that comes along with it. Patients under the care of Sugar Land Face and Body Plastic Surgery find that Dr. Humble creates a beautification journey that is equally safe and comfortable, from the first moment to the last. When a patient has a consultation, Dr. Humble ensures it feels like conversing with a longtime and trusted friend. He considers more than the physical appearance of his patients; he takes into account their lifestyle, their health, medical history and if they are looking for corrective or preventative care. He never pushes a procedure on a patient, instead, he listens to what a patient wants before offering options, whether it be a surgical or non-surgical one.